The holidays are right around the corner! They bring opportunity to relish household customs AND opportunity to incorporate new customs! (See “Turkey Traditions” for a fun family activity.) Favorite recipes are one of the most common markers for holiday tradition. ‘Round these parts, there are certain foods that MUST be made in order for a holiday to be a holiday! I hope you’ll keep your tribes kitchen traditions, but in the event you’re ready to add a new one, DoAhead Dining will be featuring our family’s favorite recipes over the next few weeks. Today I’m sharing one of the best renditions of cooked yam I’ve ever tasted. It’s perfect for Thanksgiving or Christmas. Peel, then thinly slice yams. Lightly grease a casserole dish (I use my Corning Ware dish that is roughly 9 X 13). Place a layer of yams in the bottom of the dish. Season to taste with salt, pepper, brown sugar and cinnamon. Layer and repeat seasoning. 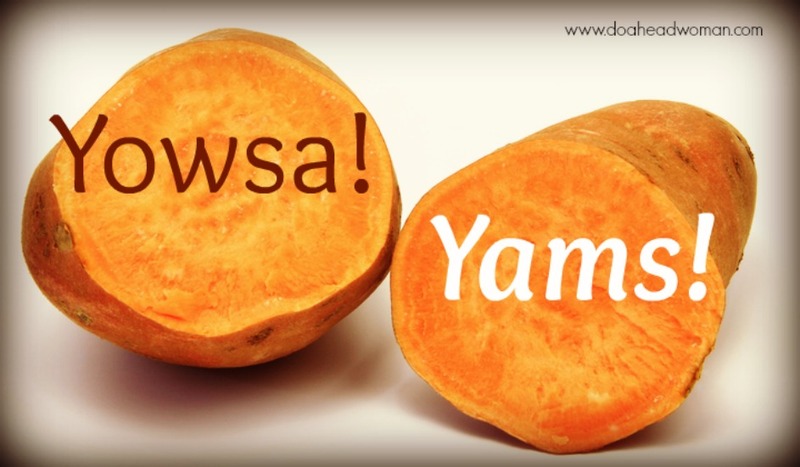 Continue this process until all your yams have been used or you reach the top of your dish! Pour whipping cream over the yams until the cooking dish is approximately 1/2 full of cream. Cook 1 hour at 350 degrees (or until yam is tender). Word of caution. Be careful not to cook too long or the cream may “curdle”. Once cooked you may place your oven’s temperature on the lowest setting (175 degrees) and keep warm until serving time. That’s it DoAheads! The yummiest yams ever! Hi Cindy! For the yams have you ever done them the day before, refrigerated and then re-warmed the next day?